The following post doesn't really have anything to do with the purpose of this blog, but because I enjoy pranks... here we go! 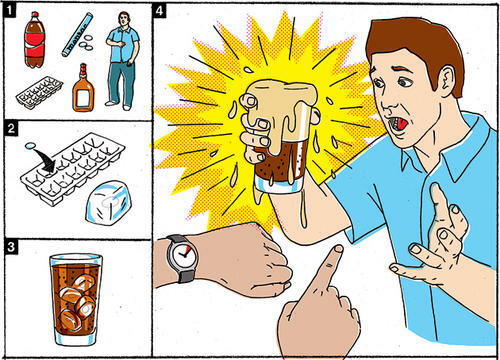 "Wired's HOWTO wiki suggests freezing Mentos into ice cubes and then serving them in Diet Coke-based cocktails as a kind of timed practical joke (the cubes melt, and the drink turns into a volcano). Diet Coke is recommended "because it isn't sticky.""